Our first real trip in 2016 was a last minute affair thrown together by Josh for some of our closest friends. 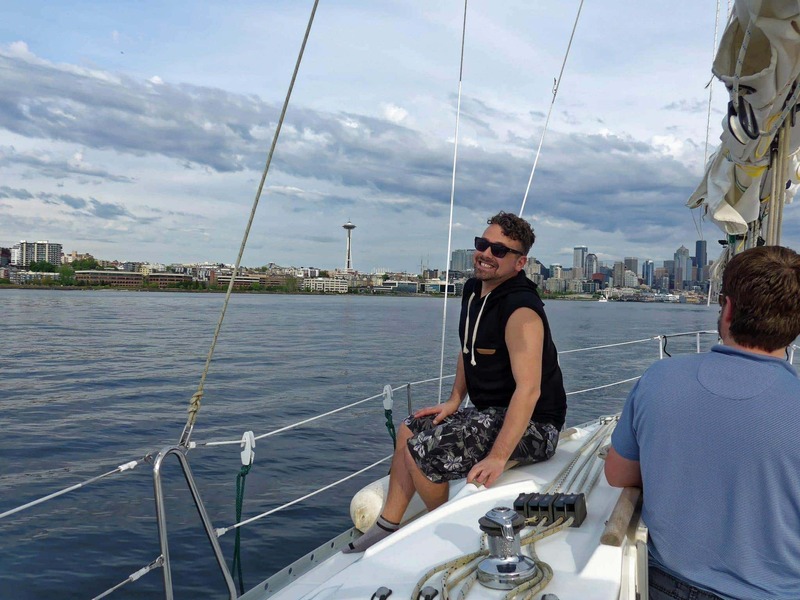 After a week of amazing weather including temperatures in the 80’s, we decided to do an evening sail/motor around our home marina in Elliott Bay and take advantage of the weather. 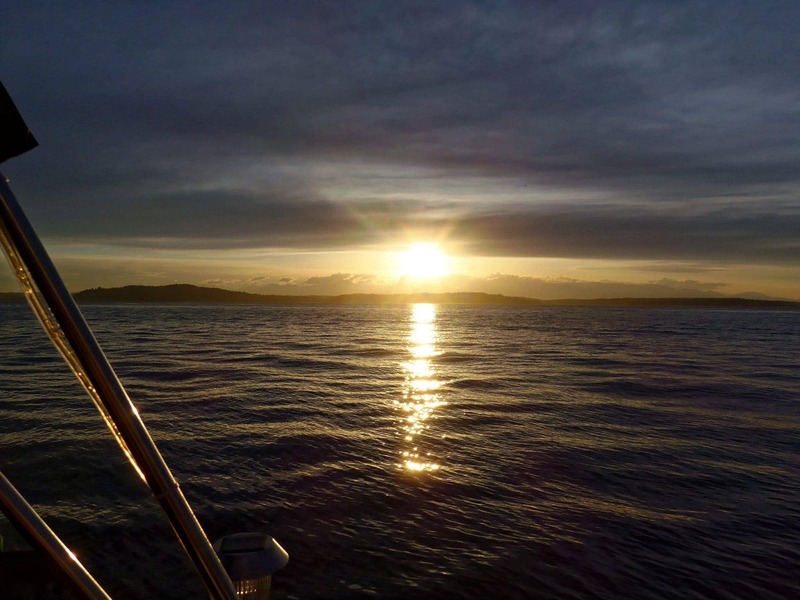 We were rewarded with warm breezes, only one or two other boats, porpoises, and a magnificent sunset. 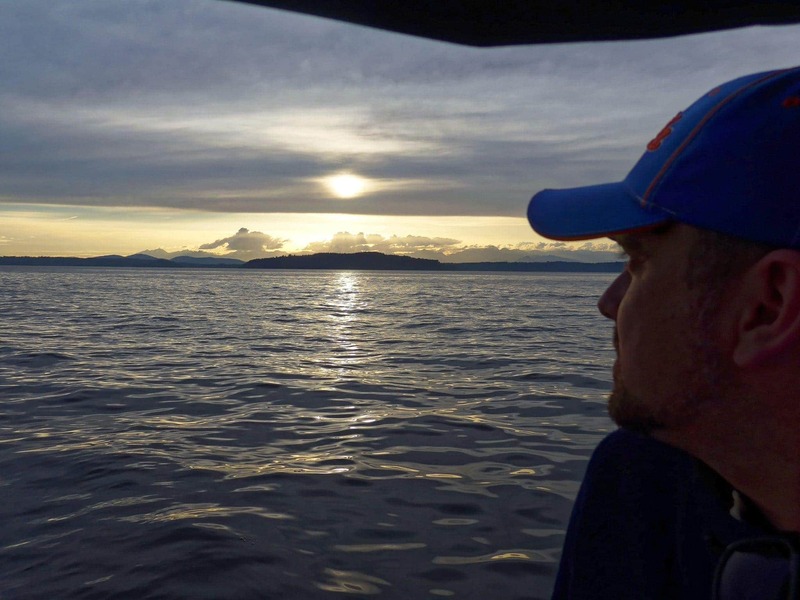 Our trip started out with a nervous captain (me) hoping that everything I had done in the winter was still holding together, and that there wouldn’t be any issues with our first trip out. Leaving the dock was uneventful, although Grace exhibited a more pronounced than usual slowness in backing and turning, as I expected with growth on the hull. 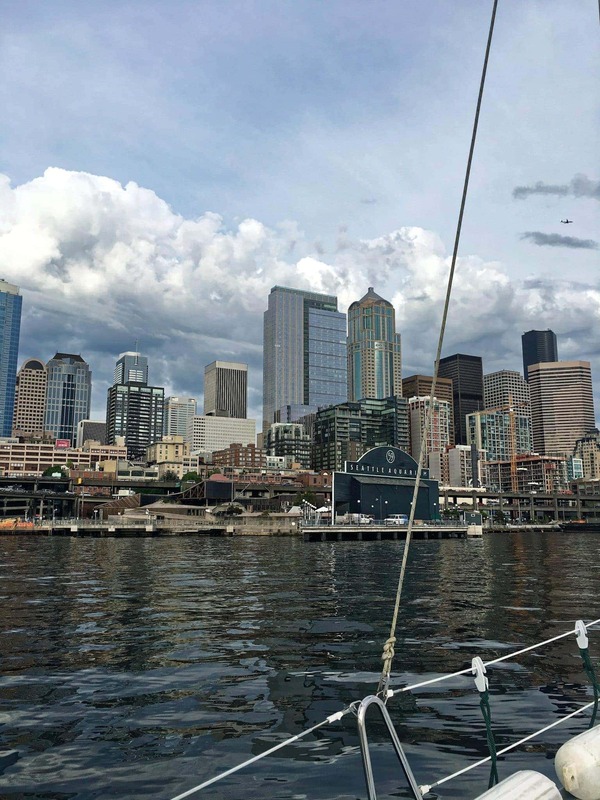 There was not a breath of wind for us to take advantage of, so we motored over towards downtown Seattle. 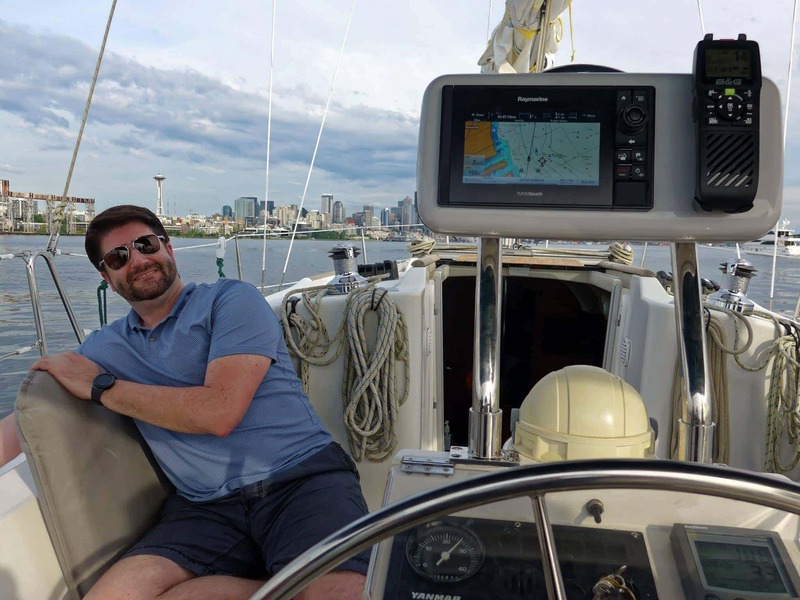 This was the first trip out using the new Raymarine Evolution autopilot, and other systems like the wireless B&G VHF handset. Everything worked perfectly, and required no tweaking at all. The autopilot really impressed me as it followed all of the routes and waypoints I was inputting on the MFD, made course changes, and did everything I expected it to do with clear notifications and accuracy. Of course we couldn’t avoid taking a few pictures with the famous Seattle skyline in the background. 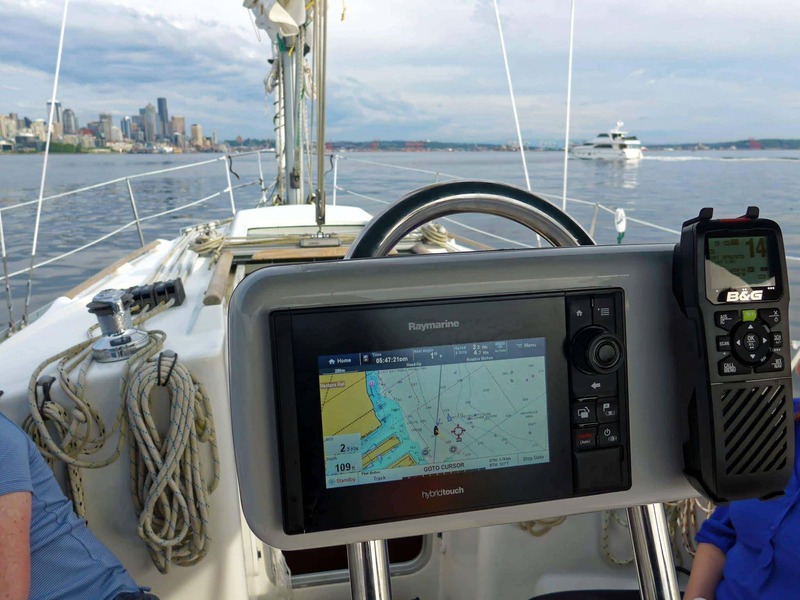 We passed by Bell Harbor Marina and the Clipper Around the World Race boats looking beautiful and ready for visitors. 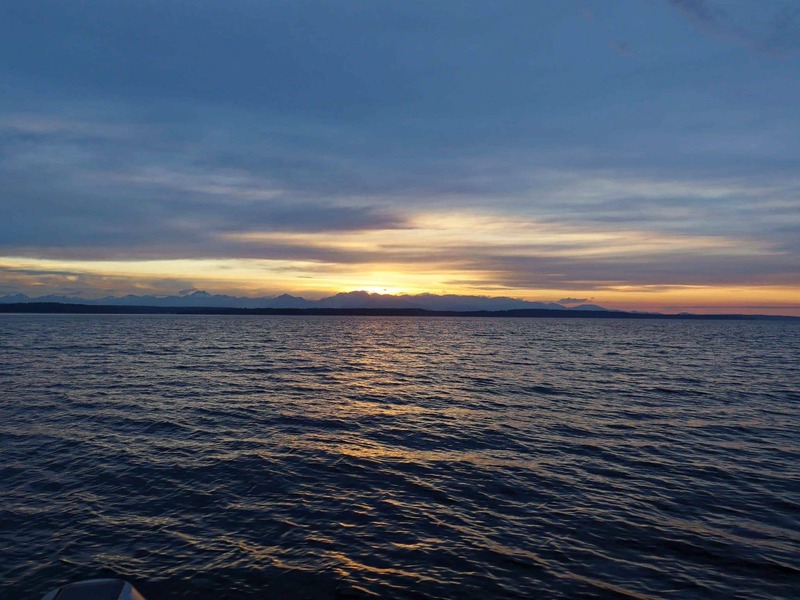 After reaching the aquarium, we turned away from the city to avoid Coleman Dock and the Washington State Ferries, and headed over towards Alki Point and beach. 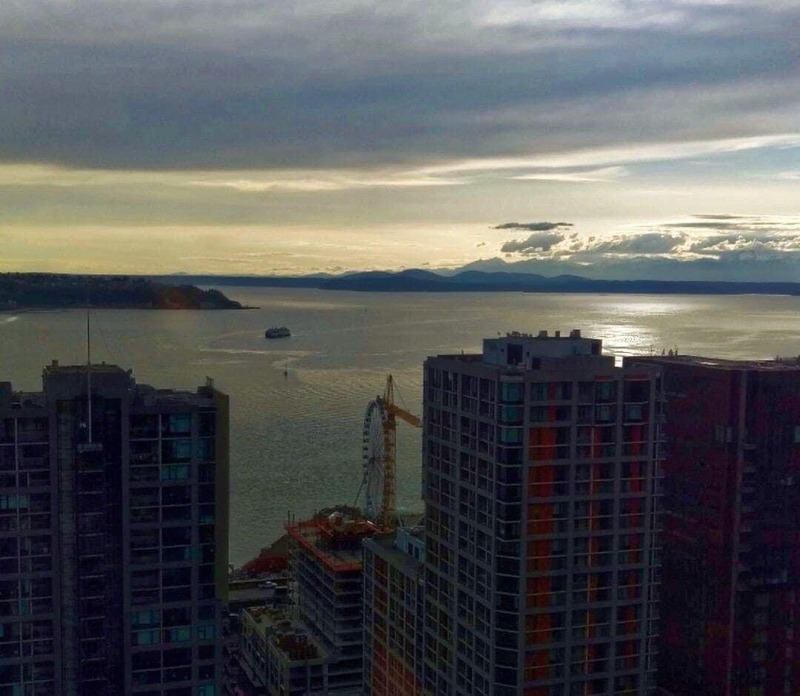 A friend took a photo of us from his office in downtown – we’re the tiny speck you see just this side of the ferry! There really were no other pleasure boats out besides us. We made our way around Duwamish Head and down along Alki beach, gazing at folks in the surf, lines of cars on the road, and thinking about how we could get Spud’s fish and chips. Josh served dinner about this time, which was various fun things from Specialties including tiny square sandwiches, grapes and cheese, and more. 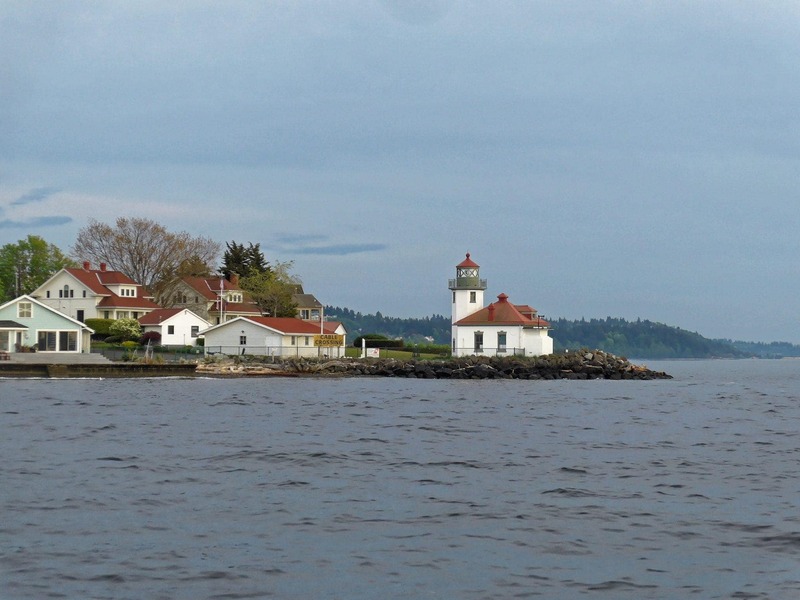 We passed around Alki Point Lighthouse and started seeing a lot of activity on the surface of the water. After a few minutes, we spied what we believe to be harbor porpoises surfacing. We bobbed around for a long while with them circling us, and then started to head back towards the marina slowly so we could catch the sunset. The porpoises followed us for a while, to the delight of everyone. 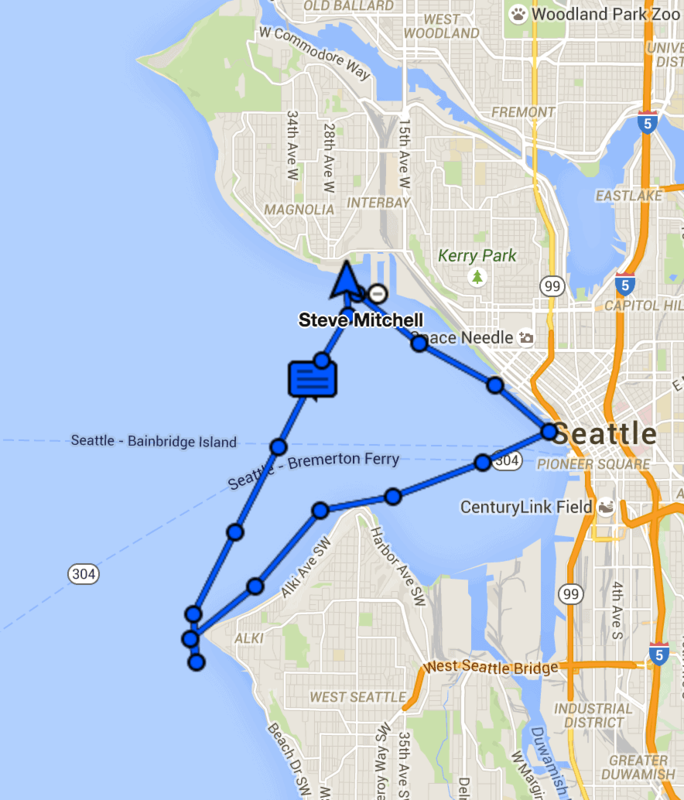 This was my first trip with my new DeLorme inReach Explorer. I had been a SPOT customer since early 2008, back to their original device, but their support and lack of additional features had me looking around for alternatives when my subscription expired this year. DeLorme has gotten great reviews from many other friends, and I liked both the maps and tracking frequency, and the ability to pair it with a phone and send text messages other than the “I’m OK” prebuilt messages. I’m going to do a more in-depth dive into some features at some point, but I was happy to be able to simply start tracking, and sharing my info with folks on land. 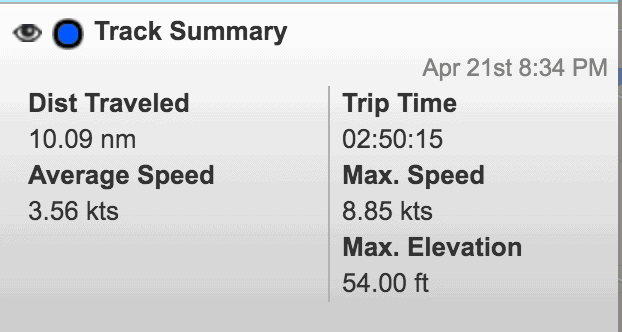 All told we ended up going about 10 nautical miles in about 3 hours. Not the fastest trip in the world, but the crew enjoyed it! The sunset was absolutely stunning, and we all have hundreds of landscape photos that no one will ever want to see, but I’m still posting a couple here. 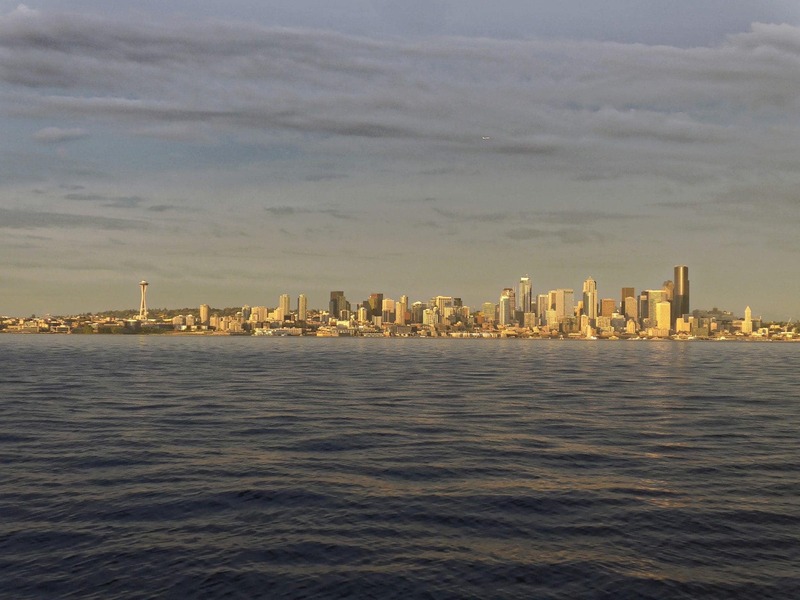 One of our favorite things to see with guests is the sunset when it hits the buildings of the downtown Seattle skyline. We were not disappointed! There was a recurring theme discussed on board all evening about how beautiful a place we live in, and mother nature didn’t disappoint. It’s one of the reasons I love living here myself, and will never leave! The trip back got a little cold for some, but we were at the marina dock about 9PM and everyone was on their way home safely, relaxed from the trip and ready for bed. All in all a good first motor trip for the season, with many more to come. I’m glad everything worked as expected, and am looking forward to using the new systems added since last year on longer trips. I am perpetually looking for better lights for Grace, both inside and out. I stumbled across the Mantus Snap-On Light randomly a few months ago and love the portability, easy install, and light quality that it provides.